Not as easy as it sounds. Find out how to make sitting on the floor more achievable for you. Watch the 5 min video here. How much time do YOU spend sitting each day? Use this calculator to get real about your sitting habits and why it matters. Standing desks are not necessarily the answer but they can help. Read more here. And more interesting too ! Katy Bowman, MS, biomechanist and director of the Nutritious Movement Institute explains how your body requires not only a variety of dietary nutrients but also a variety of mechanical ones. Read more here. If you are gripping your glutes when simply queueing at the supermarket, or washing the dishes, or even when trying to walk down the street (which will also cause your legs to externally rotate giving you a duck waddle), you’ll need to replace it with things that get you back to your original supportive architecture. Find out how here with latest advice from Brooke Thomas, Rolfing Practitioner, Yoga Tune Up Teacher and Corrective Exercise Specialist as well as founder of the excellent website, Liberated Body. Here’s a foot care routine developed by Katy Bowman, MS, biomechanist and director of the Restorative Exercise Institute that you can easily do at home. It’s recommended to do this 15-minute routine barefoot every day (or as often as possible) for best results. Do all the movements in a row, or do them separately (in any order) throughout the day whenever you can squeeze them in. There’s no excuse really ! While bodywork specialists have been passionate about fascia for decades, it took new research on how fascia and muscles work together (some of it presented at the first international fascia research conference at Harvard in 2007) to get different health professionals — from orthopaedists to GPs and pain experts to personal trainers — to catch on. Read more here. Here’s a great visual overview on breathing and how your breathing affects the placement of your internal organs; for good and bad. Eric Franklin of the Franklin Method does the explanation here for Part 1 and here for Part 2. You’re probably heard the phrase that “sitting is the new smoking” in terms of the harm prolonged sitting can have on your health. It turns out that’s not quite true. Sitting is fine – as long as it’s on the ground or as close to it as possible. Check out the basic floor-sitting poses you should be aspiring to do (pillows and props are allowed; as are multiple changes of posture!) as explained by Peter Derycke. Read more here. Does stretching make you more flexible ? It turns out that might not be the case. But it might be the case. It all depends on how you do it. Let Brooke Thomas (Rolfer, Yoga expert and Restorative Exercise Specialist) explain. Read more here. Before you resolve to exercise more this year, read this article here. Katy Bowman, a renowned biomechanics expert and founder of the Restorative Exercise Institute, explains the difference between exercise and movement and why it’s important to our health to understand the difference. 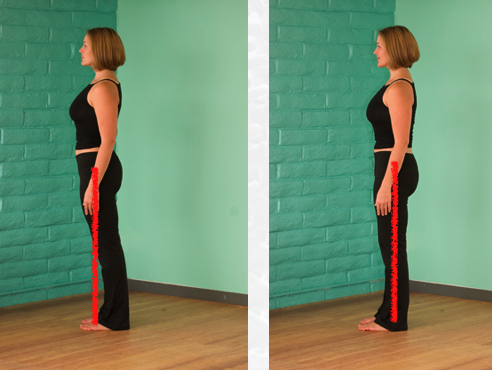 Katy Bowman, a renowned biomechanics expert and founder of the Restorative Exercise Institute, explains in this article here how many people try to “hide” their thoracic kyphosis (forward slouch) by pulling their shoulders back causing their ribs to thrust forward and shearing the vertebrae in the upper mid back as a result. Ouch ! In this very short clip here from German television, Dr. Robert Schleip, one of the leading figures in the new field of fascia research, and from the University of Ulm, shows what fascia looks like and talks about it’s relevance in terms of our bodies’ structural integration, hydration and sensory perception. (2.5 minutes).